Steve Weisenburger of Tuttle, North Dakota. Lot 2 at $28,000, L83 2Strong 13F, DOB 2-24-2018, KJHT Power Take Off x Red Six Mile Tidal Wave 254T, sold to Matt Griffith of Shawnee, Oklahoma. Lot 1 at $7,500, L83 Fury 9F, DOB 2-14-2018, KJHT Power Take Off x Six Mile King Ranch 721W, sold to Craig Johnson of Rugby, North Dakota. Lot 7 at $7,500, L83 Horizon 18F, DOB 3-3-2018, Six Mile Spencer 111B x Six Mile Game Face 164Y, sold to Ashley Farms of Voltaire, North Dakota. 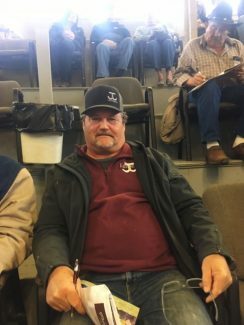 Lot 27 at $7,500, L83 Frontier 64F, May 9, 2018, Red Six Mile Crosby 325C x Six Mile Game Face 164Y, sold to Patrick Svenningson of Harvey, North Dakota.